NEW DBX 676 Tube Microphone Preamp Channel Strip. Fully Insured With Online Tracking! DBX 676 Tube Microphone Preamp Channel Strip. THE PEDIGREE OF PROFESSIONAL AUDIO. We at dbx Professional Products are proud to introduce the all new 676 Tube Mic Pre Channel Strip. The 676 represents all of the best of dbxs more than 40 years of dynamics processing. The 676 offers a pristine high-voltage, Class-A tube preamp section that runs on 250 volts, so your signal can be as crystal clean or dirty as you need it to be. The 676 also incorporates the compressor/limiter design from the highly-sought after dbx162SL, as well as a 3-band parametric EQ with sweepable mids. The 676 provides audio professionals with the perfect channel strip for recording and live applications alike with its military-grade build and vintage-inspired controls, VU metering and state-of-the-art optional digital output card. Class-A Vacuum Tube Preamp with High Voltage Gain. Compressor designed from the dbx162SL. 1/4 and XLR Inputs and Outputs. Mic Preamp Connector Female XLR Pin 2 Hot; Electronically balanced/unbalanced. Mic Preamp Input Impedance 1.9 k. CMRR >85 dB from 20 Hz to 3 kHz, >70 dB from 3 kHz to 20 kHz. Instrument Input Connector Tip-Sleeve ¼ Jack. Instrument Input Impedance 500 k. Max Input (instrument) +21dBu unbalanced. Preamp Insert Connector Tip-Ring-Sleeve ¼, RF filtered. Preamp Insert Type Unbalanced, Tip = send, Ring = return. Line Outputs (Preamp & Compressor/Limiter) Connector Male XLR and Tip-Ring-Sleeve ¼ (Pin 2 and Tip hot). Line Outputs (Preamp & Compressor/Limiter) Type Servo-balanced/unbalanced. Line Outputs (Preamp & Compressor/Limiter) Impedance Balanced 30 , unbalanced 15. Line Outputs (Preamp & Compressor/Limiter) Maximum Output Level > +21 dBm (into a 600 ohm load). Compressor Sidechain Insert Connector Tip-Ring-Sleeve ¼, RF filtered. Compressor Sidechain Insert Type Unbalanced, Ring = output, Tip = input. Compressor Sidechain Insert Impedance 1 k (output), 50 k (input). Vacuum Tube Type 12AU7A / ECC82. Vacuum Tube Grid Power Supply +250V DC. Vacuum Tube Heater Power Supply +12V DC. Frequency Response (Mic Input) 20 Hz to 50 kHz, +0/-1dB, 40 dB gain. Frequency Response (Instrument Input) 30 Hz to 70 kHz, +0/-1dB, unity gain. THD + Noise (Mic In to LIne Out) 0.25% typical at 0 dBu out, 1 kHz, 40 dB gain. THD + Noise (Instrument In to Line Out) 0.2% typical at 0 dBu out, 1kHz, unity gain. Equivalent Noise Level Typically > -123 dBu with a 150 source load, 22 Hz to 22 kHz. Noise Floor Mic Insert to Comp Output: <-93 dBu, unity gain, EQ flat and no gain reduction. Preamp Function Switches/Controls: Instrument Input Selects between microphone XLR input and front panel ¼ instrument input. Preamp Function Switches/Controls: +48V Sends +48 VDC through 6.81 k resistors to pins 2 and 3 of the microphone input. Preamp Function Switches/Controls: 20dB Pad Attenuates the microphone input by 20 dB. Preamp Function Switches/Controls: Polarity Invert Reverses pins 2 and 3 of the microphone input XLR. Preamp Function Switches/Controls: 80 Hz Low Cut Enables an 80 Hz, 12 dB/octave high pass filter in the microphone and instrument signal path. Preamp Function Switches/Controls: Gain Control Range - to +55 dB for Microphone Input; - to +40 dB for Instrument Input. Preamp Function Switches/Controls: Post Tube Attenuation - to 0 dB. Preamp Function Switches/Controls: Peak Indicator Illuminates RED when the Preamp is within 3 dB of clipping. EQ Low Frequency 100 Hz, Low-pass shelving filter. EQ High Frequency 10 kHz, High-pass shelving filter. EQ Mid Frequency Sweepable from 100 Hz to 8 kHz. EQ Function Switches/Controls: Narrow Selects the Q of the MID Frequency EQ. OUT position Q = 0.9; IN position Q = 2.9. EQ Gain (All Bands) Sweepable from 15 to +15 dB. Compressor Threshold Range -40 dBu to +20 dBu. Compressor Threshold Characteristic Selectable OverEasy or Hard Knee. Compressor Ratio Variable 1:1 to :1; 60 dB maximum Compression. Compressor Attack/Release Modes Selectable Manual or Auto. Compressor Manual Attack Time Scalable program-dependent; Typically 400 dB/msec to 1 dB/msec. Compressor Manual Release Time Scalable program-dependent; Typically 4000 dB/sec to 10 dB/sec. Compressor Auto Attack Time Program-dependent, typically 15 ms for 10 dB, 5 ms for 20 dB, 3 ms for 30 dB. Compressor Auto Release Time Program-dependent, typically 120 dB/sec. Compressor Output Level Control Range -20 dB to +20 dB. Compressor Peak Indicator Illuminates RED when the Compressor/Limiter is within 3 dB of clipping. Limiter Threshold Range -4 dBu to + 22 dBu (off). Limiter Attack and Release Program-dependent. Operating Voltage 100 240 VAC, 50/60 Hz. Turn-On Time Approximately 2 seconds. Dimensions 3.5H X 19W X 8D (88.9mmH X 482.6mmW X 203.2mmD). Weight 8.1 lbs (3.7 kg). Fully Insured with online tracking. To discuss any questions or concerns you have. Dirt, scuffs, scratches, grease, dust et al... Always keep clean hands when playing your instrument, whether you are returning or keeping your instrument. This includes: Headsets, Harmonicas, Microphones, Mouthpieces. We are Authorized Dealers for all product lines we carry. It is truly our goal to get you the right instrument, safely in your hands. With your ZIP Code for a quote. We will NOT lower the value of any package. WE'LL BEAT ANY ADVERTISED PRICING! We will match or beat any authorized dealer advertising a lower price (This claim excludes blow-outs, b-stock, or close-out sales). Learn about Music For All ». Unparalleled Service - Extended Hours, Monday - Saturday. We are Authorized Dealers for every product line we sell. We will be here when other sellers have disappeared. Each product we sell is NEW and Factory Sealed. If a product arrives DOA, we will immediately send a replacement to you. Music For All is a growing family owned business which has roots beginning on the internet in 1997. Our website has seen many incarnations over the years as the Internet has evolved. We take pride in a website with an emphasis on clean, informative pages with high-resolution large pictures and a focus on functionality for ease of use for our customers. Our customers continually come back to us because we actually care about you and your development as a musician. When you call, you can expect to talk to a real musician, not an order taker. We sell and know music instruments. Our business has evolved simply for the love of music and the joy of inspiring and being inspired by music. Our motto is simply "No Music, No Life". We have seen music influence generations, bring people together, change lives, moods and so much more. Music is the only mathematical equation that produces emotion. We embrace the fact that each genre of music is equally important to the fabric of human life. Any requests to lower the value will not be honored. 3 Your order will be packed extremely good and as well as humanly possible. If the item can be tested (like an Accordion for instance) we will do so that you get your item right the first time. Many items are double-boxed and surrounded on all 4 sides with loose. And/or bubble wrap to insure the safest possible trip to your hands. 5 Your item will be in proper working order when it leaves our hands. We can't overstate enough that we take the time to pack items extremely well, to avoid any damage to your item. 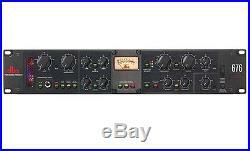 The item "Dbx 676 Tube Microphone Preamp Channel Strip Worldship! FREE US Ship, AK & HI" is in sale since Wednesday, June 01, 2016. This item is in the category "Musical Instruments & Gear\Pro Audio Equipment\Preamps & Channel Strips". The seller is "musicforallbiz" and is located in Rockford, Michigan. This item can be shipped to North, South, or Latin America, to all countries in Europe, to all countries in continental Asia, to Australia.